Update: You bough ‘em all. 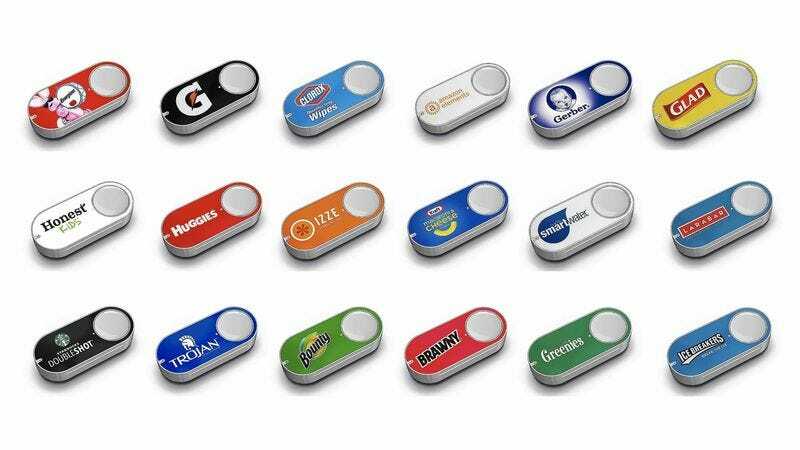 If you’re curious about Amazon Dash buttons, there’s never been a better time to stick them around your house. For a limited time, our readers can purchase up to three buttons for just $1 each (with promo code KINJADASH), down from the usual $5. Plus, you’ll still get a $5 credit the first time you use it, meaning Amazon’s literally paying you to buy household essentials. As of this writing there are still 1,600 redemptions available for this code, they’ll go fast. Conceal your booze or just safely bring some liquid camping thanks to this huge Stanley water bottle and flask sale from Amazon. This style has been around for over 100 years and for good reason. The vacuum-sealed steel design basically started the craze of finding the best place to put hot or cold liquids and keep them that way. Mpow has been one of the forerunners of the impulse-priced Bluetooth headphones craze on Kinja Deals, and their newer Antelope models feature noise cancellation 6.0 and better battery life, to name a few features. At $15 for either color, this is the best price we’ve seen for these. Now that it’s finally starting to cool down, it’s time to prepare yourself with this $11 Zippo hand warmer. Unlike disposable chemical hand warmers, this Zippo lasts for up to 12 hours at a time, and can be reused by filling it with a splash of lighter fluid. Plus, it just looks really cool hot. This seatbelt cutter/spring-loaded window hammer is small enough to fit in any glove box, or even on a keychain, and at $5, it’d be a perfect little stocking stuffer. Just use code 7WDW2ZAW at checkout to get the deal. It is such a missed opportunity that this deal wasn’t out in time for everyone to have it delivered by last night, but oh well.